I’ll admit that perhaps I went in to this one with unrealistic expectations. Monsters, Inc. is one of the greatest Pixar films, bettered only by Finding Nemo and Wall-E in my opinion, so from the moment I saw the trailer some months ago, whether I liked it or not, I was excited about Monsters University, I’m talking Toy Story 3 type excited. I’ll start with the positives. Firstly, I was overjoyed on discovering some time ago that the film was to be a prequel rather than a sequel. The beautifully poised and satisfying ending to the 2001 original left just enough hanging in the air that I feel any definitive continuation to – “Boo?”, “Kitty!” – would have been an affront to the magic of imagination. 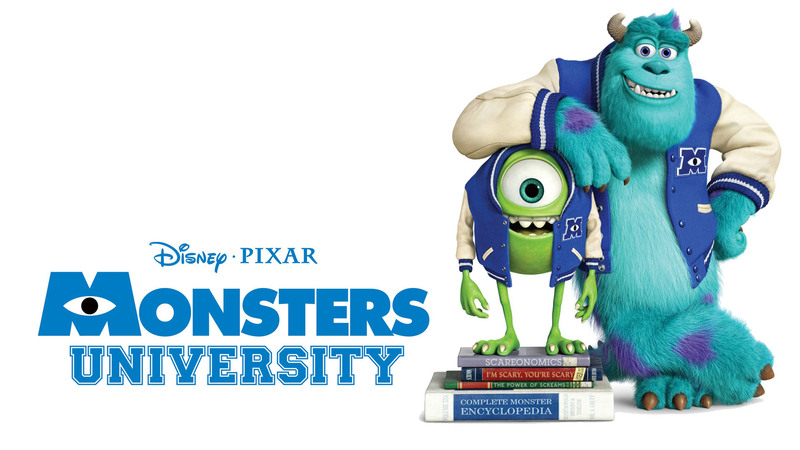 What is nice about this film, then, is that as the title suggests, we are instead treated to the adventures of Mike Wazowski and James P. Sullivan at the start of their blossoming bromance, as ‘scare majors’ at the prestigious (and curiously Ivy League-esque) Monsters University. What I appreciate in this choice of setting is that the film’s creators have obviously given a respectful nod to the key demographic and fans of the original. The eager and impressionable tweens of twelve years ago (myself included) are now the same age as Mike and Sully are portrayed in Monsters University, and many will either be college students themselves or very recent graduates. Disney/Pixar are second to none when it comes to nostalgia, and the sight of a (more than usual) pea sized Mike adorning his dorm room with posters and nervously making new friends certainly had me smiling and reminiscing on my own recent University experience. Speaking of Mike’s new friends, the real heart of the film is provided by an array of fluffy, scaly and sticky monsters known collectively as the Oozma Kappa fraternity. (I could go on here about the visual beauty of the animation, but by know you should know this is more or less a given with Pixar, so to save everybody time and effort, I will simply state that the aesthetics are, unsurprisingly, stunning.) There is no groundbreaking characterisation here, just the tried and tested formula of ‘misfits turned heroes’, but when you can do it as well as Pixar can then why stray from convention? As well as these loveable new monsters, we are also treated to cameo appearances from a number of characters from the original including Roz and The Abominable Snowman, with special mention needing to be given to the story of arch enemy Randall Boggs and his transition from friend to foe. However, as much as I was impressed with the film’s direction and aims, it is not without its flaws. The biggest of these is a real problem with pacing. The film began slowly, found its rhythm thirty minutes in, raced along merrily and happily for another thirty minutes and then unfortunately the most important final handful of scenes felt like a messy and misguided mixture of way too slow, way too fast, way overlooked and way under looked. Perhaps not the biggest problem for a transfixed child, but to me it felt like the creators were deliberately (and ineffectively) sacrificing the flow of the film to wedge in a few more customary moralising and life affirming speeches from Mike or from Sully. Sometimes, just sometimes, I’d rather reach the end of an enjoyable cartoon adventure in a crescendo rather than a considered monologue about striving to be anything you want to be. Another slightly more personal gripe I had was the thought that Abigail Hardscrabble, head of the University and main villain of the piece, did not seem to ‘fit’, for want of a better word, in to the Monsters universe. Voiced by Helen Mirren, the character looks more like an evil insect from A Bug’s Life than a monster, with a centipede like body and distinct lack of any odd or interesting colouring. I understand that the character is supposed to be less vibrant than our heroes, but something about her didn’t sit well with me, including the fact that Mirren’s voice work sounded rather dull and uninspired. 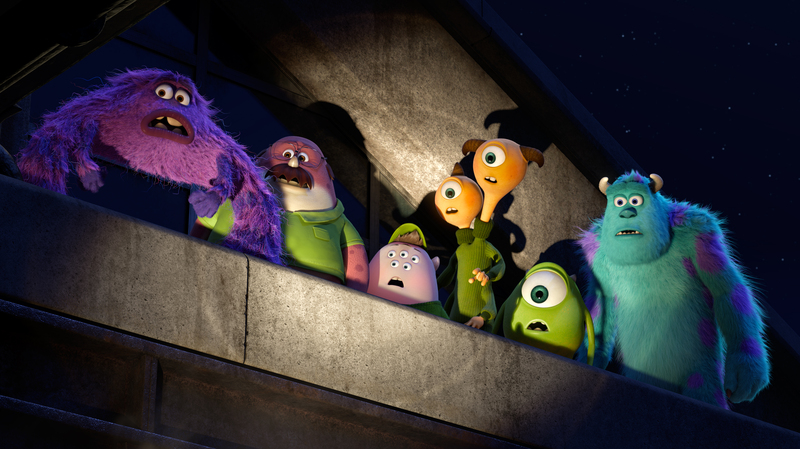 Overall, Monsters University gets a three out of five from me. Not Pixar’s finest work but far from being its worst. As I left the cinema I asked myself why I did not feel as warm and satisfied as those twelve years ago when I watched the original. Was it that, ultimately, I am now too old to truly enjoy animated pictures? I decided this wasn’t the case, as I thoroughly enjoyed recent releases Brave and Wreck-It-Ralph. I was happy to see Mike and Sully again, but for all its good intentions, Monsters University comes up just short of a classic. Hey, good review. I for one really enjoyed Monster’s University – not as much as the original – but I am just so glad to someone else sharing the love for Brave. Truly underrated movie.